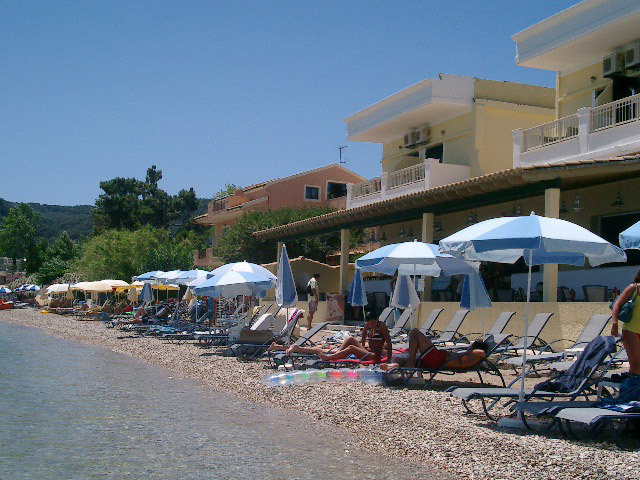 Not far from Mesonghi, Moraitika is developed along the coast road that connect Corfu town with Lefkimni village in the south part of the island. Moraitika is becoming bigger year after year and probably in the future will become together with Mesongi an unique town. Placed along the river, on the opposite side of Mesongi, Moraitika is more tourist with its pubs and accommodation. The area near the beach is more peaceful than the centre of the village. You can find the centre along the main road, with its shops, restaurants and tourist places. The old and traditional village of Moraitika is placed above a hill just behind the modern village. Here there are few old houses, the church of Theotoku Kimseos and a wonderful view overlooking the coast. 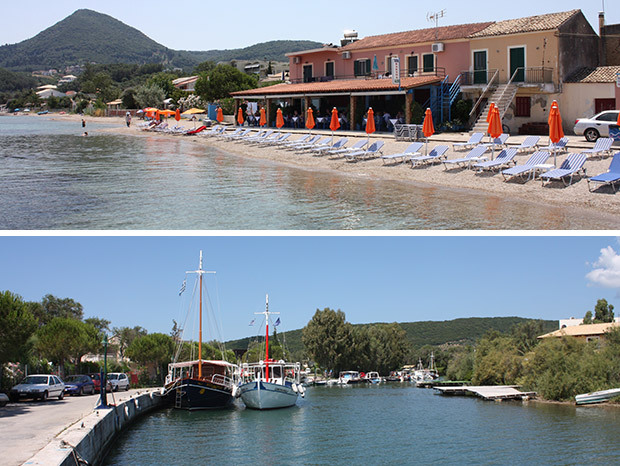 Mesonghi is a small-size village along the east coast of Corfu, just 13 kilometres far from Corfu town. Mesongi is divided from the nearby Moraitika by a cape and a small river. This village is a calm and relaxing place but it also offers some accommodation and tourist structures. The Moraitika beach is both sandy and rocky, it has medium-size and it’s well equipped if you wish to enjoy some water sports like windsurf. 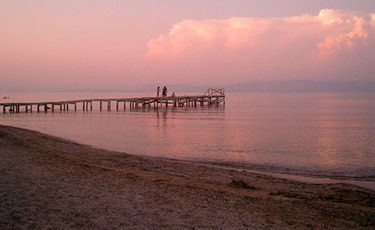 There are also diving tour or boat trips to visit the coast of Corfu till Lefkimmi. This bay is very popular as Moraitika is the largest village in this part of the coast. Moreover Moraitika beach is ideal for children as the sea is not very deep. The beach of Mesonghi is not very particular except the surrounding scenery. Along the left side of the beach there’s a river that runs into the sea and, on the right side, there’s a green hill. 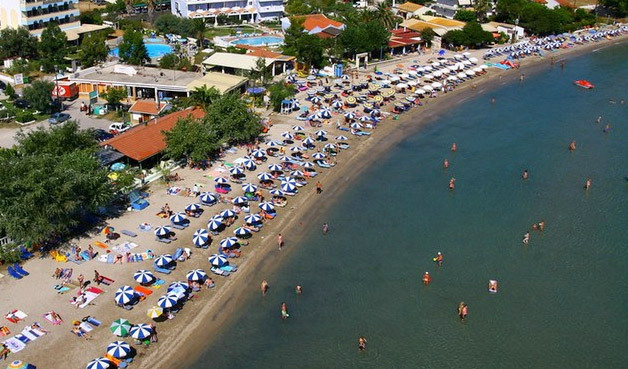 The beach is safe and relaxing, as it’s far from the main road and well organised with snack bars and children areas. On the beach you can rent Pedaloes or enjoy water sports. Mesonghi and Moraitika are connected with Corfu old town and some others villages many times every day by the local bus service. You can also hire cars, jeeps, motorbikes or bicycles to move autonomously around Corfu island. In both towns you can find many kinds of local shops like supermarkets, pastry shops, jewellery shop, tour operators and tourist shops. In this part of the coast only Kavos is better than Moraitika for the night life. In Moraitika you’ll find several cocktail bars, disco clubs and places with live music open till late in the night. In comparison with Kavos, Moraitika is chosen more by families and young couples. In both Mesognhi and Moraitika after your dinner in an international restaurant or a fast food, you can decide to have a drink in a nice cocktail bar. If you’re looking for something more for the night, you need to reach the near resort of Moraitika. In the south part of Corfu island you can have an unforgettable experience with a dinner in Bacchus, one of the best traditional Greek restaurants on the island. Stamatis tavern as here is the oldest traditional fish restaurant. It is still managed by the same family since fifty years and still preserve the warm and genuine Greek atmosphere. Moraitika and Mesonghi offer many tourist accommodation like apartments and small studios in front of the sea.